Nearly everyone on this site has heard of Dave Ramsey and his Financial Peace University. He’s changed a lot of lives! And helped people get out from under piles of debt. 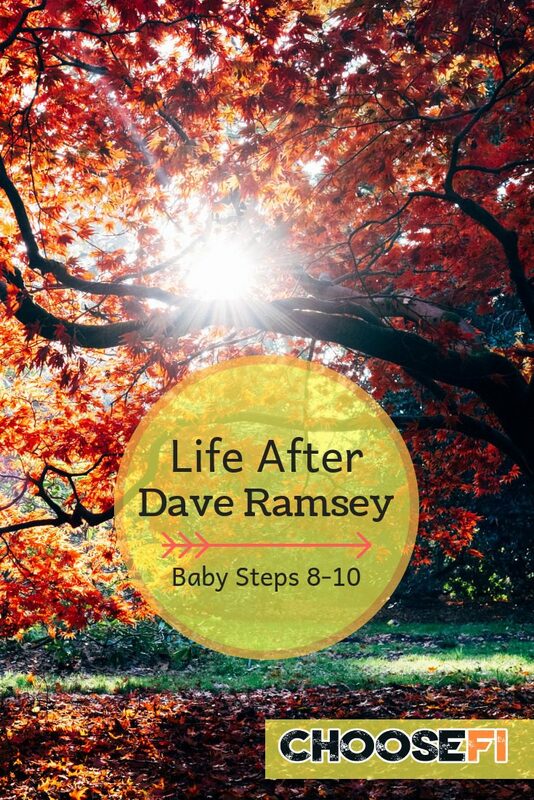 Of course that’s all well and good, but what happens after you’ve completed all of Ramsey’s seven Baby Steps? What happens when you’re debt-free? How do you maintain financial freedom? I’ll answer these questions and more today! This piece is based on episode 68–Financial Peace Graduates. Baby Step seven–Build wealth and give! Since this is the final step, I want to break down both of these points. You’re probably left wondering; how do I continue to build wealth? Luckily, now that all your money isn’t going towards debts, you’ll see your bank account grow at a much faster rate. But, you don’t want that to go to your head, or else you’ll end up in another debt-loop. There are a few ways you can continue to make money (besides your day job). Investing can help your money grow. And the best part is, you don’t have to do any of the work! M1 Finance is our favorite automated investing site. You can choose from stocks and ETFs for free! No, really, actually for free. It’s part of M1's mission. You can also purchase fractional shares of ETFs–making it a more realistic investment option for people who are just starting out. Sticking to a budget is key to keeping your spending in check. Luckily, we’re in the age of technology, so there’s an endless amount of ways to budget–which, you probably already know since you've managed a budget enough to pay off all your debt! It’s just as important to stick to a budget now that you’re financially independent, as it was when you were trying to reach FI. The second part of step seven is to give. It’s just good karma! Now, this doesn’t just mean give money to charity (although, anyone with the means to do so, should), it can also include giving of your time to your favorite cause. If you've completed the baby steps you might be wondering what to do now, we’ve got a few more steps for you to follow! Now that your present is free of debt, it’s time to start thinking about your future! Some people put off saving for retirement until they’re debt free–but, now it’s time to get serious about retirement. What retirement account should you use? Even if you contribute to an employee-sponsored plan, you should seriously consider opening and maxing out a Roth IRA. The biggest benefit of a Roth IRA is that you’re taxed upfront, so when you pull your money for retirement, you won’t be subject to any taxes! If you listen to the episode this post is based on, Andy talks in-depth about pre-tax retirement accounts. If you’re self-employed, you have more options! An SEP IRA or Solo 401(k) are your best bets. An SEP IRA is a lot like a traditional IRA, but the contributions limits are a lot higher. You can contribute up to $56,000 in 2019. That’s a lot more than the $6,000 for a traditional IRA. A Solo 401(k) is exactly what it sounds like: A 401(k) for a sole proprietor, rather than a business. You can contribute as much as if you opened up a 401(k) with your employer–$19,000. The HSA is the Firewalker's secret retirement account and offers a triple tax benefit. The contributions are tax deductible, the growth is tax free, and the withdrawals are tax free as long as you use them for health related costs, including insurance premiums. If you have an HSA eligible insurance policy you may want to consider maxing out your HSA and paying out of pocket for any health care costs that arise. This allows you to take maximum advantage of the HSA. If you have maxed out your tax advantaged accounts you'll want to move on to investing in taxable accounts. You can do this for free at M1 Finance. The key to FI isn’t always spend less, it’s also make more money! You can do that in a host of different ways, and they don't always involve starting a business (although, that is one of the options). Here are just a couple things that Andy suggests you do to create a passive income for yourself. This is one of the staples of the FI community. If you have the money to invest in real estate that you can rent out, it's one of the best ways to make passive income! You can go about this a few different ways. You can buy homes, fix them up, and sell them, or go the easier route and be a landlord (or you can hire a property manager). Or, you can go an even easier route and invest in real estate crowdfunding. If you had a side hustle just to get by in order to reach FI, it’s time to upgrade to a job you really like! You don’t have to leave your full-time job (unless you want to), but having a side hustle doing something you’re passionate about can help you feel more fulfilled and you’ll be making more money! The age of the internet has helped a lot in this area. Even the oddest hobbyists make money from their own creations. Whether you’re a blogger, a woodworker, an artist, photographer—the list is literally endless—you can make money from your passion. It just takes a little planning. Be realistic–Don’t quit your day job until you have a lucrative side business. Find a mentor/apprentice–Even if this involves taking a few night classes, you’ll be better off finding someone that knows the business. And don’t worry–you’re never too old to continue your education! Be patient–None of this will happen overnight, which you should know from paying off your debt. This is not an exhaustive list, but combining just a handful of these can help you remain financially independent, and you can even quit that day job you hate!